Why Literature? Why YSJ? Recent graduate Becky Lowe explains why you should choose us! - Words Matter. Why Literature? Why YSJ? Recent graduate Becky Lowe explains why you should choose us! Becky Lowe graduated with a degree in Literature in November, and has been working at York St John University as a Special Events Intern. The following interview was originally published on our Alumni blog, where you can also find out what many of our former students have been up to since graduation! Becky Lowe, pictured second from left. At graduation I was told by a fellow graduate that their first memory of me was during week one of our degree, where I answered the question, ‘why did you choose to study English Literature?’ with, ‘I’m not entirely sure because I don’t like reading’. So, I would say I have come a long way from there, and it would not have been possible without the inspiring lecturers and students I encountered during my undergraduate degree. What struck me most during the early months of first year was how much lecturers invested into their students. We were not seen as ‘just another number’ which my friends experienced at other universities; our lecturers cared about us and if we are willing to work hard, they would do whatever they could to ensure we succeeded. 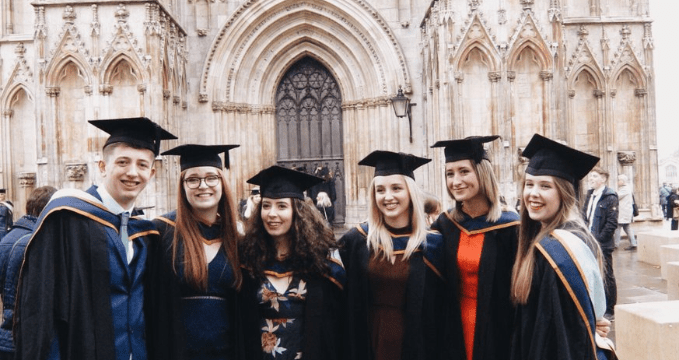 At the beginning of my degree, I was convinced that as soon as my degree was over I’d move straight back to Sheffield; by the spring of third year, I was finding any excuse or opportunity to stay in York, but more importantly, at YSJ. York St John has such a community feel and even though my experience at YSJ was from a student’s perspective, I could see from academics- particularly from the English Literature department, and even from staff members outside academia, that it is a great place to work. Going out into the working world is a scary one, so what better way to have your first taste of full time work than in a place which has already given me so much confidence in my abilities both academically and socially? I made it my aim to stay at YSJ for at least another year after my studies finished, and so the internship programme was the perfect opportunity. It offers the chance to gain knowledge and experience in a field which I hope to pursue, while gaining diverse skills simply about the transference from student to full-time worker. The best way I could describe it is a leap into a comfort blanket- a step up from the supported and safe place of undergrad study, but not a blind and lonely leap into the working world, which I feared. The internship training sessions which we had during the first few weeks were majorly beneficial. We had the opportunity to meet as a group made up of individuals who were fresh out of YSJU and all in the early stages of working at YSJ. It was comforting to know that all the worries people had were mutual, and so we were able to seek comfort in that we were not alone in our concerns which then helped us overcome it. Previous PostPrevious 2018 on the Literature Programme: In Your Words!